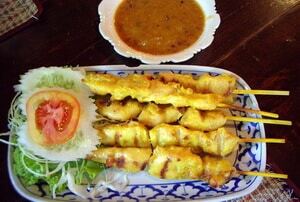 Satay are Malaysian-Indonesian dish from Southern Thailand. Recipe for Thai Food is sweet and aromatic from the turmeric and garlic, rather than hot or spicy. This is served with its own satay sauce made with peanuts, coconut milk and palm sugar. The satay can also be served with Cucumber Relish. Mix the curry powder, garlic, white pepper, turmeric, salt, sugar and fish sauce together, add the chick, cover and place in the fridge to marinate overnight. When you are ready to cook, soak wooden skewers in water for 15 minutes to prevent the ends from burning during cooking. Thread the marinated chicken pieces on to the pre-soaked wooden skewers, brush with coconut milk and barbecue or grill for about 3 minutes, until cooked, Garnish and serve with satay sauce.